What can we learn from the Ramayana to become effective managers in the corporate world? Ramayana is one of the great epics of India are a Holy Scripture which is originally authored by sage Valmiki. It represents the duties of any relationship which narrate the ideal characters like the ideal King, the ideal brother, the ideal wife, the ideal servant, the ideal father and many more ideal characters. The Ramayana tells the Ram’s journey. The Ramayana range over the concept of Dharma and the human values. Despite being one of the ancient Holy scripture even today we can learn management and leadership lessons from Ramayana. In simple terms, management of any kind is the act of bringing people together to work for achieving your desired aim. Management has five functions that involve Planning, organizing, commanding, controlling and coordinating. There are many books, articles, journals that talk about management theories and real life experiences, but before the today’s modern management gurus or experts gave their principles and theories, Tulsidas and Valmiki had explained it in the ancient Hindu epic Ramayana. In Ramayana, it is explained that how one can mentally prepare himself for the job and analyze the complete situation to win from the rivals. When Hanuman gets an opportunity to locate Sita then how Jambavan motivated Hanuman to go into the enemy house. When he reached the Lanka then he did a complete study of the Lankans and analyzing their strengths and weaknesses. This is what management is all about by ascertaining the goals, get mentally prepared for it, having a right plan and analyzing the strengths and weaknesses of the competitors. The SWOT (the strength, weakness, opportunity, threats) analysis is one of the very important aspect of management. In Ramayana, Rawan again and again shows the qualities of a bad manager, that make bear him in the long run. As it is said that the Businesses are run on the relations, the one who can keep good relations with the employees can do wonders for his organization or company. All these things say about the great deal of management. From Ramayana you can learn management lessons with perfect examples of the ideal characters. Anyone can learn management lessons from Ramayana and can be an effective manager in the corporate world. One of the top most management principle is to motivate your team. We can learn this thing from Ramayana that when Hanuman went Lanka. Hanuman’s mission was to find Sita there and convey her Lord Ram’s message. When it was confirmed that Sita is in Lanka then Janmant asked Hanuman to go there. Jamwant helped Hanuman to realize his true potential and motivated him to go to Lanka. We can learn the lesson from Ramayana and can apply in the corporate world that how Jamwant motivated Hanuman as a good manager to help him in realizing his true potential and act like that. A good manager or leader is the one who can get work done even by its opponents. A good manager hears all the things that his subordinates say to him and try to keep them together in the oddest situations. When the company or an organization is not in good situation, thena good manager’s responsibility is to listen to his subordinates and keep them together. In Ramayana, Rawan shows the qualities of a bad manager many times. And this reason becomes the departure of his kingdom. Rawan did not listen to his managers from the starting and from that there is a situation came in the state of war with Ram because of Rawan’s mismanagement, one of the wisest managers, Vibishan left his kingdom in between a crisis. There always comes a time when a leader has to create more leaders. So that they can make their own independent decisions. And there is not anymore dependency on anyone to make decisions in the bad situations. When the Sita’s whereabouts was known then Hanuman, from his own burn the Lanka. The Ram was not happy with Hanuman’s decision by burning Lanka. After that, Hanuman stopped taking decisions on his own. Then Ram removes himself from the scene so that Hanuman can take his own decision and rediscover himself to make things right. During the war, the Mahiravan succeeded in kidnapping both Ram and Laxman and take them into Patal Lok. From the physical and intellectual power, Hanuman succeeded in rescuing both Ram and Laxman and thus Ram created a leader and from that Hanuman could use his abilities of leadership. In Ramayana, two brothers Sugriva and Bali became enemy of each other. The reason of enmity, of two brothers was misunderstanding or miscommunication. Because of the sour events, Rama could do his task. In management, be careful of happening miscommunication at any stage. This could lead to a big crisis. A manager or leader should always motivate and believe in his team to achieve desired goal. A manager who believes in his team definitely met with his goal achievement. The army of Rakshasa was very powerful and unbeatable. They had defeated many devas and powerful kings. But the soldiers in the Ram’s army were not originally soldiers and they had never experienced that experienced army before. But the Rama built confidence in his army to fight. By Ram’s confidence and enthusiasm make his army to fight and conquer victory. This is the top most management lesson one can apply in the corporate world. Leaving the comfort zone is the most important thing in any business or enterprise. In today’s world, the marketing experts or gurus who travel the world, get good experience of customer’s taste or like, better serve the market. In Ramayana, when Rama was ordered to live in the forest for the course of fourteen years, then Rama and Sita took it as a challenge to involve with the ordinary people of their kingdom to better understand their problems and situations. They didn’t remain limited in the comforts of their palace. It helps them to understand the ground realities in a better way. A good manager’s responsibility is to make a clear plan and execute it successfully step by step. In Ramayana, When Hanuman gets responsibility to search Sita then Hanuman has done this task brilliantly and single highhandedly. This way, he gave an introduction of his wisdom that how he conducts himself in the task and single minded is a perfect example to be followed by the managers in the corporate world. At the time of crossing the sea, he rejected the invitation which was given by Mount Myna-aka to take some rest in the way to better complete the task. Having a clear vision is a very important thing in the corporate world as well as in all aspects of life. A clear vision will always be a motivating factor in focusing on the goal and not to be turned a side of it. It is very important for a leader to have a clear vision that what he is aiming for and what consequences he has to bear in the future. He should also becareful of his subordinates or followers that who is helping him to achieve his goal. In the Ramayana, the Ram’s vision was clear that he has to save his wife Sita and to defeat the evil personalities. The clarity about goal forced his army to put their soul and heart in the war to save Sita. A good manager’s quality is to have patience in all the situations. Maintaining cool in the bad situations helps a person to achieve its goal. 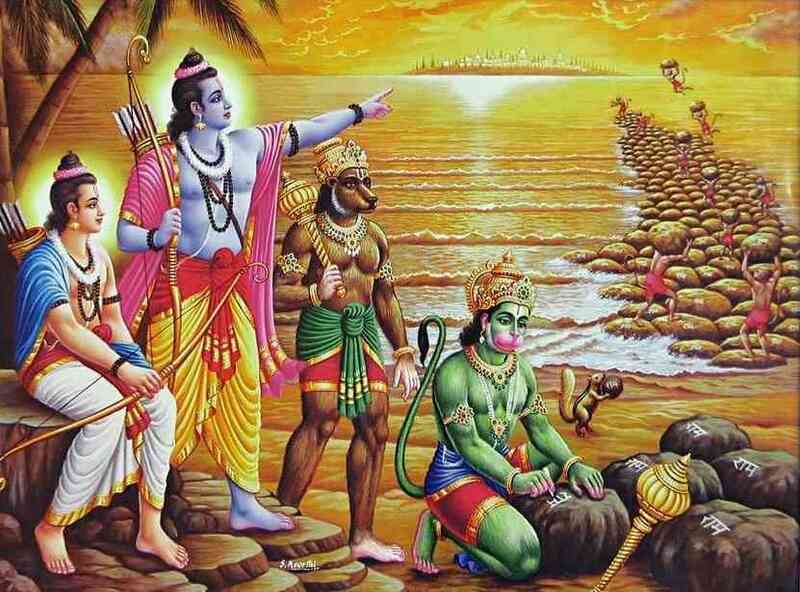 In Ramayana when Sita was kidnapped then Ram wandered resource lies in the forests to search the Sita. In Ramayana, it is detailed that how Ram feels sad, deeply and the memories which were linked with Sita. But his intense sorrow did not stop him for searching the Sita even he did not know the single detail of the enemy. Even in the worst situations while battling with Rawan, the Ram maintained his courage and patience and by doing this, he inspired his army to not only continue the battle but even win it. A good manager’s quality is to not to be attracted by doubtful attractions in his way. In Ramayana, when Sita got madly attracted by a beautiful golden deer, she refused to take notice to her husband’s advice. She could not pay attention on that the deer could not be a natural deer, it can be an evil in the false appearance. It is her unpleasant trouble of acquiring the deer to be her playmate that forced Ram to go behind the scene. Afterwards it became the way of getting her separated by his husband Ram and get kidnapped by Rawan.